World leaders gathered this week in Washington for the 2016 Nuclear Security Summit. Russia, which has one of the largest nuclear arsenals in the world, has boycotted the summit, claiming there was a shortage of “mutual cooperation” in designing the summit agenda. NCSEJ and other American Jewish organizations met with President of Azerbaijan Ilham Aliyev who was in Washington for the summit. We had a very productive discussion on a number of issues, including the United States and Israel’s strategic relationship with Azerbaijan. We also discussed the vibrant Jewish community of Azerbaijan and thanked President Aliyev for the close relationship between Azerbaijan’s government and the country’s Jewish community. NCSEJ also attended summit programs which featured the leaders of Ukraine, Georgia and Kazakhstan. We continue to closely monitor the situation in Kolomyya, where as we reported last week vandals have continuously targeted a Jewish cemetery. NCSEJ Kyiv Representative Ilya Bezruchko has met with Jewish members of Ukraine’s parliament on the issue, and will continue to raise it with government officials. Purim celebrations were held throughout the countries of Eurasia and Eastern Europe last week. The update includes stories about the festivities. 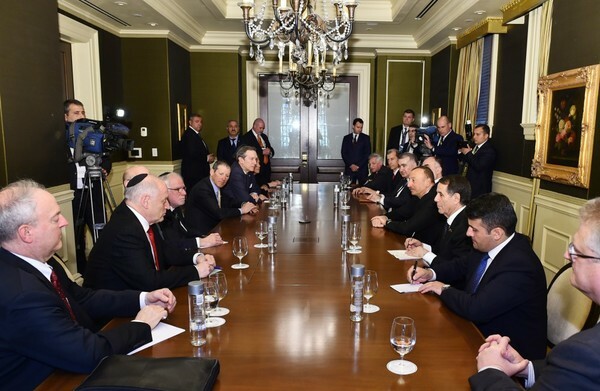 President of the Republic of Azerbaijan Ilham Aliyev has met with heads of the American Israel Public Affairs Committee, National Coalition Supporting Soviet Jewry and the Conference of Presidents of Major American Jewish Organizations. The sides noted that such meetings had already become traditional, opened good opportunities for conducting a mutual exchange of views and contributed to the strengthening of cooperation. Heads of the American Jewish organizations hailed Azerbaijan`s growing successes, adding that they witness this during their visits to the country. They said they were deeply impressed by the beauty of Baku. They said such meetings contributed to the development of both Azerbaijan-US and Azerbaijan-Israel cooperation. They hailed Azerbaijan-US relations, noting that Jewish organizations contribute to these ties. The sides expressed mutual interest in developing cooperation. First ever themed Purim celebration attracts hundreds! The Israeli Style Purim Extravaganza on Purim in Vilna was a huge hit with all ages, who took in the full Israel experience in the “Jerusalem of Lithuania”! The participants thoroughly enjoyed the Israeli food, varied interactive activities and games related to the main sites of significance in the Holy Land! In all, it was a memorable Purim celebration that brought joy and uplifted all! The director of the Library of Ukrainian Literature in Moscow, who has already been accused of inciting extremism and ethnic hatred, is facing fresh charges. The lawyer for Natalya Sharina said on March 31 that his client will be formally charged by Russian investigators on April 5 with two counts of misallocating library funds. The lawyer, Ivan Pavlov, said the authorities had "trumped up" new charges after realizing their initial case against Sharina was too weak. Sharina, 58, was detained in October and charged with inciting extremism and ethnic hatred by carrying books by the Ukrainian ultranationalist author Dmytro Korchynskiy, whose works are banned in Russia. The Kremlin has accused unnamed foreign governments and media organizations of seeking to disrupt Russia's upcoming parliamentary elections. In unusually pointed remarks to reporters in Moscow on March 28, Kremlin spokesman Dmitry Peskov also asserted that the unnamed organizations were trying to discredit President Vladimir Putin. "They continue to actively try to influence our country. They continue to rock the boat in our country," he was quoted as saying. Peskov specifically named the International Consortium of Investigative Journalists, saying it was looking into Putin's family and friends. The consortium -- a Washington-based network of reporters in more than 65 countries-- did not immediately respond to a voicemail message and email seeking comment. Peskov's remarks were the latest in a growing number from top Russian officials alleging that the September parliamentary vote may be disrupted by outside forces. March 29, 2016, will mark the 12th anniversary since Lithuania joined NATO in 2004. Fellow Baltic States, Latvia and Estonia, joined NATO on the same date of the same year. Events at various army units across the country will be held to mark the occasion. U.S. Secretary of State John Kerry called on Wednesday for "an ultimate resolution" of the two-decade-old Nagorno-Karabakh conflict between Azerbaijan and Armenia during talks with Azeri President Ilham Aliyev at the State Department. Aliyev is in Washington for a two-day nuclear security summit hosted by President Barack Obama on Thursday and Friday. "We want to see an ultimate resolution of the frozen conflict of Nagorno-Karabakh that needs to be a negotiated settlement and something that has to be worked on over time," Kerry said during a brief photo opportunity with Aliyev. The conflict broke out in the dying years of the Soviet Union but efforts to reach a permanent settlement have failed despite mediation led by France, Russia and the United States. Nagorno-Karabakh lies inside Azerbaijan but is controlled by ethnic Armenians. In 1945, Aleksandar Lebl returned to Serbia after escaping the attempted genocide of all Jews in World War II and reclaimed his family's confiscated house. But the 93-year-old is one of the very few of Serbia's Holocaust survivors who came back to recover their homes. Many thousands of others were murdered or left no heir and their property, seized by the Nazis or the puppet government in Belgrade, was incorporated into the Communist state after the war. Today, more than seven decades later, Serbia has passed a law offering some belated redress to its now tiny Jewish community. One of the first of its kind in eastern Europe, the "heirless property restitution law" passed in February will see thousands of previously Jewish-owned buildings handed to the country's Association of Jewish Communities. The association plans to rent out most of the properties, and from 2017 Serbia will also pay an annual 950,000 euros ($1.1 million) for 25 years in financial support to the community. The funds will be spent on education, fighting prejudice and preserving the memory of Holocaust victims, along with supporting survivors, said its president, Ruben Fuks. The Ukrainian Parliament finally voted to oust Ukraine’s odious prosecutor general, Viktor Shokin, on Tuesday. The United States and European countries that have provided aid to Ukraine had long pressed for his dismissal; in his year in office, Mr. Shokin became a symbol of Ukraine’s deeply ingrained culture of corruption, failing to prosecute a single member of the deposed Yanukovych regime or of the current government while blocking the efforts of reform-minded deputies. Alas, nothing is likely to change unless President Petro Poroshenko and Parliament agree to install some real corruption fighters and approve serious judicial reform. Corruption has been pervasive in Ukraine since independence, fed by close-knit ties between politicians and oligarchs and a weak justice system. The protests in 2014 that led to the removal of President Viktor Yanukovych were largely fueled by popular fury at his monumental corruption and abuse of power. Yet his overthrow has yet to show results. A recent report from NATO asks a frightening question "Could the Islamic State go nuclear"? It's not an idle question, as U.S. President Barack Obama described nuclear terrorism as "the single biggest threat to U.S. security." To address this risk, the U.S. is hosting a major nuclear security summit from March 31 to April 1 in Washington, D.C. There is one major shortcoming with the summit though: Russia — one of the world's two dominant nuclear powers — plans to boycott it. This decision represents the collapse of the once-thriving nuclear security cooperation between Washington and Moscow — one which both sides bear responsibility for. In the early 1990s Washington discovered that poverty and chaos caused frightening security defects throughout the vast Russian nuclear complex. Unpaid guards at nuclear sites were frequently absent. Insiders at Russian nuclear weapons plants tried to steal and sell nuclear materials on the black market. A senior White House science adviser even discovered enough highly enriched uranium (HEU) for several nuclear bombs sitting unguarded in a Moscow Institute. Timothy Ash: Where's the IMF money for Ukraine? Ukraine has had no IMF cash since August 2015, and Ukraine has only actually finished one review thus far under the $17.6 billion program agreed last April – close to one year on. Roughly $6.6 billion in IMF money was released in the first two tranches last year $5 billion plus $1.6/$1.7 billion), while a further $3.9 billion in disbursements scheduled through to March this year have been stalled, and a further $1.8 billion had been due to be disbursed from April to the end of 2016. Actually a lot has been achieved over the past year in terms of reform implementation – fiscal adjustment, energy sector reform, PSI, banking sector reform, monetary/exchange rate/NBU reform, et al…but cash is being stalled because of creditor concerns over “rule of law” related issues and concern over political stability and how this will play to continued adherence to IMF conditionality. Early April will see the closure of Ukraine Today, which had been the only full-time English language TV news service offering Ukrainian perspectives to international audiences. The channel will reportedly continue online, but the end of its broadcasting is a sobering development hinting at the difficulties of finding sufficient funding for major Ukrainian English-language media projects. (Editor’s note: both authors worked for Ukraine Today.) Ukraine’s threadbare English-language coverage just got even thinner. Nevertheless, efforts to introduce Ukraine to international audiences continue, with the latest arrival seeking to put the spotlight on the country's most cosmopolitan city. April is traditionally an optimistic time of year in Odesa. It is the month when the Black Sea port lazily shakes off its prolonged seasonal slumber. The city’s elegant Tsarist-era boulevards once again fill up with swaggering and stylish strollers, while its rich cultural life gently moves into top gear. For the first time ever, the start of spring will be trumpeted in English, thanks to the arrival of the city’s first English-language lifestyle monthly. The Odessa Review, which launches this month, is an English-language magazine designed to make Odesa more accessible to international audiences. It joins a small band of English-language media outlets charged with trying to bridge the international information deficit of all things Ukrainian. The task facing these English-language outliers is a Herculean one. Despite being the largest country in Europe, Ukraine remains terra incognita. This lack of visibility has been a major factor behind the success of Russia’s information war, creating a security headache for the entire continent. Latvian authorities shut down Russia's pro-Kremlin news site Sputnik on March 29, calling it a "propaganda tool" and drawing an immediate rebuke from Moscow. Latvia's local domain registry suspended Sputnik's right to hold the news site Sputniknews.lv, which was established only a few weeks ago to reach out to Latvia's large Russian-speaking minority with articles in Russian and Latvian. "We don't regard Sputnik as a credible media source but as something else: a propaganda tool," Latvian Foreign Ministry spokesman Raimonds Jansons told AFP. Russia's Foreign Ministry called the decision "blatant censorship" and insisted "the Russian mass media adheres to the highest standards of professionalism and ethics." Oleksandr Zaslavskyi didn’t have the opportunity to learn much about his Jewish faith and heritage. But one thing he is sure of is that Israel is the place for every Jew, and he has been dreaming of living there for many years. But with the war in Ukraine, the increase in the cost of living and the family moving forward, they got the push they needed to make the decision to come to the land of their people, the Land of Israel. The Pentagon has drawn up plans to position American troops, tanks and other armored vehicles full time along NATO’s eastern borders to deter Russian aggression, in what would be the first such deployment since the end of the Cold War. The Pentagon intends the plans as an escalation of a proposal it announced last year, when it said it was looking at ways to increase U.S. military deterrence in Eastern Europe, such as prepositioning older materiel in the region. Some countries on the North Atlantic Treaty Organization’s eastern flank have expressed concern about the depth of the U.S. commitment to their defense—especially in the wake of Russian President Vladimir Putin’s intervention in Ukraine. The eldest daughter of slain Russian opposition politician Boris Nemtsov has been honored by the U.S. State Department for championing "democracy, education, and freedom of information" in her homeland. Zhanna Nemtsova was among 14 recipients of the State Department's International Women of Courage Award presented by Secretary of State John Kerry at a March 29 ceremony in Washington. Kerry praised Nemtsova for speaking out against Russia's "officially sanctioned propaganda that spreads lies" and "for unwavering courage and tireless work to expose corruption and defend the legal rights of Russian citizens." Nemtsova, 32, left Russia several months after her father was shot dead near the Kremlin on February 27, 2015, saying she had received death threats as she pressed for further investigation into the slaying. In July, she announced she was leaving her job as a journalist at the Russian news outlet RBK in order to join Deutsche Welle's Bonn office as a reporter in their Russian department. The arrest of seven members of an organized crime gang in Moldova in late 2014 was unremarkable for a part of the world where such underworld networks run rampant, except for what authorities said they were trafficking in: uranium-238. Like its chemical cousin, uranium-235, uranium-238 is radioactive. The difference between the two is that uranium-235 is the central ingredient in building a nuclear weapon, a task that requires technical sophistication and specialized equipment. Uranium-238, many law enforcement and nuclear experts fear, could be the central ingredient in building a dirty bomb, which would cause few immediate casualties but spread cancer-causing radioactive material over a wide area. The danger that a terrorist group could acquire some sort of radiological material and use it to wreak havoc is central to the Nuclear Security Summit that opens in Washington on March 31. Dozens of leaders and delegations around the world will be discussing ways to keep potentially dangerous substances out of terrorists' hands. By all accounts, that effort is an uphill battle. When 2016 started there were no national elections scheduled in any of the five Central Asian countries. By the end of January, Kazakhstan had called snap parliamentary elections and Tajikistan and Turkmenistan were planning referendums to change their constitutions and allow the current leaders to remain in power indefinitely. To some it was another reminder that changes in leadership are coming closer in Central Asia, where two of the presidents are already well into their 70s. Speculation has been rife for many years about who might come to power next in the individual states but, in at least four of the five countries -- Turkmenistan, Kazakhstan, Uzbekistan, and Tajikistan -- the systems are so opaque that even guesswork is difficult. For example, no one outside of Turkmenistan (and probably only a very few inside Turkmenistan) would have thought prior to first President Saparmurat Niyazov's death in late 2006 that Health Minister Gurbanguly Berdymukhammedov would have succeeded him to become Turkmenistan's second president.